Declutter Your Life and Mind. This is a talk/workshop I am doing on March 21, 2018 at a local library. One of the areas I will be talking about is the connection between physical and emotional clutter. How do we move the physical clutter and what happens when we do? What about the emotional clutter that tends to come up? Perhaps you find the idea of clearing out more appealing than actually doing the work. If so, you are not alone. There are a lot of reasons why it is difficult to let go of our stuff aka clutter. Getting started is usually half the battle. If you are avoiding dealing with the clutter then it might be helpful to actually sit with your clutter and really look at what comes up for you. What is the resistance to doing this work? You could try writing about your feelings and see what is coming up for you. It might feel like you are not doing anything but this is a really great way to get started especially if you are feeling stuck. This helps you to start to take some control and to have power over your belongings and your space. While it is easier to see the physical clutter, if you move it without being conscious about your feelings and not paying attention to what might be underneath it, likely you will just re-acquire and end up back in the same place again. When we look a little deeper we might find there is emotional clutter as well. The clutter can very well be emotional baggage and unfinished business. Do you have old files from a previous career, love letters or cards from an ex-partner, a wedding dress from a failed marriage, books about dreams that you once had, clothing from a happier time or a time when you were a lot slimmer, or projects that are unfinished? (When I was involved in a quilting group in the past we called these UFO’s Unfinished Objects). These are all areas that can keep us emotionally stuck in our lives. Clutter can be giving us a message that we do not want to or cannot move forward. Can you see how some of these thought processes can hold you back and how they protect you from actually pursuing your dreams? 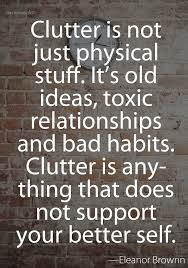 What is your clutter saying about you? How is it protecting you from moving forward? Would love to hear from you. Please comment below….. This entry was posted in chronic disorganization, De-Clutter Your Life, Emotional Clutter, Inspiration and tagged chronic disorganization, emotional Clutter, emotional responses, physical clutter. Bookmark the permalink. 6 Responses to Is there a link between physical and emotional clutter? Sounds like a great presentation. There definitely is overlap.. push and pull between our heart and our mind and our stuff. My years in the profession have taught me that there are many layers to clutter, and it is more complicated than I initially thought. Honesty, patience and support are all important when you want to clear it out. Thank you Seana for always being so supportive. I love what you are saying “push and pull between our heart and mind and our stuff” Thats really a great way to put it. So many layers and so complex for sure. We often say in our industry, it’s not about the stuff. And by that, we mean that while we may be physically handling or organizing our stuff, it’s actually way deeper than that. I love what you said about writing down your thoughts and feelings around clutter. While it might seem like you are postponing the actual work, the writing is very much part of the work. I like to think about it as readying yourself for change. Part of the readying process involves thinking and processing. Good luck with your presentation! It sounds like it’s going to be wonderful. Books can be so challenging – they are like old friends. I love your comment about the book shelf that matches lol. Our thought processes are so interesting and yes that may be true that you won’t find one that matches (but maybe that would be okay too) 🙂 thank you for your comment.